We are so excited to be a part of Kimberly Clark’s #celebratefamilyvalues campaign this summer! Family is so important to us here at Pretty Providence and we can’t wait to share some of our best ideas and activities with you guys over the next 8 weeks. We hope you love them as much as we do! 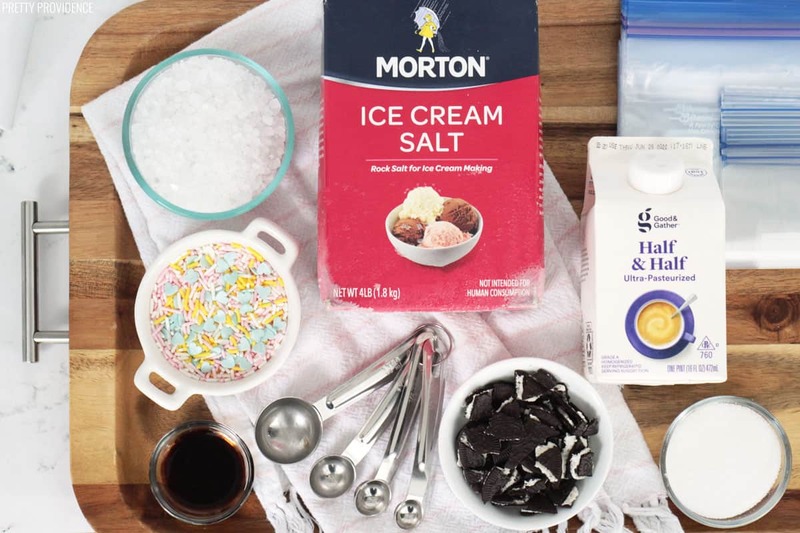 Today I’m gonna kick things off with one of my family’s favorite activities that doubles as a yummy treat: fun and easy ice cream in a bag! 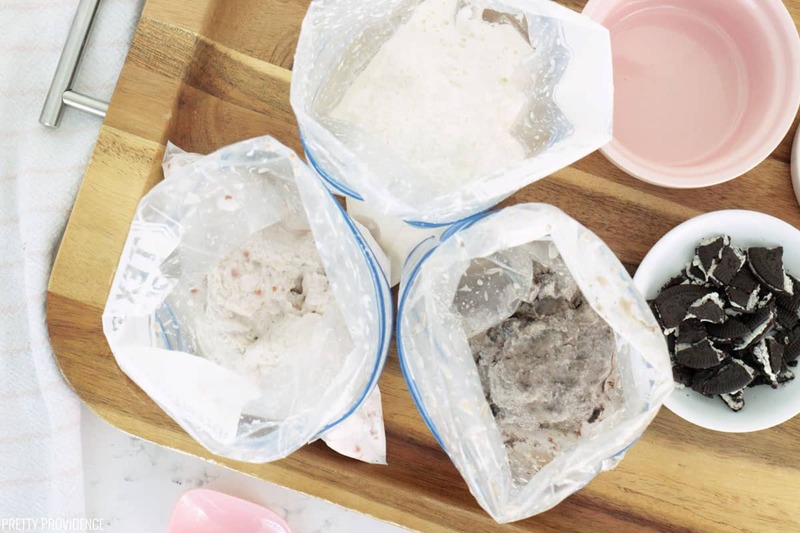 Okay, if you have never made ice cream in a bag before you are in for a serious treat! It is so easy, so fun and so delicious! 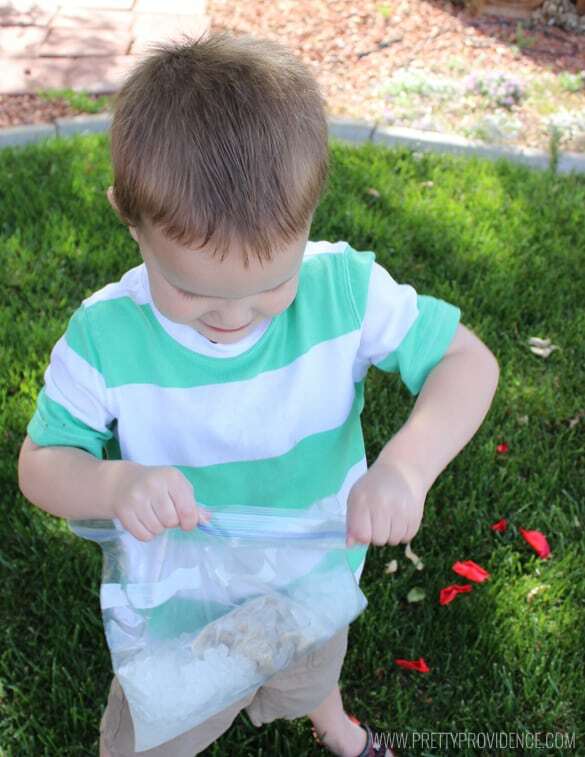 I have such fond memories of making this as a kid, and it has been such a fun tradition to start with my own little ones! This is a great treat to take camping, on a picnic, or for a family night activity or a child’s birthday party! It is perfect because everyone can pick their own flavor, and ends up with just the right serving size. Oh, and did I mention that you don’t even have to dirty a dish? Mom heaven! I can promise you won’t regret trying this recipe out with your loved ones this summer! Okay let’s get to the recipe and tutorial, shall we? Put your first three ingredients and additional topping in your sandwich sized ziploc bag, eliminating as much air as possible, and seal tightly. 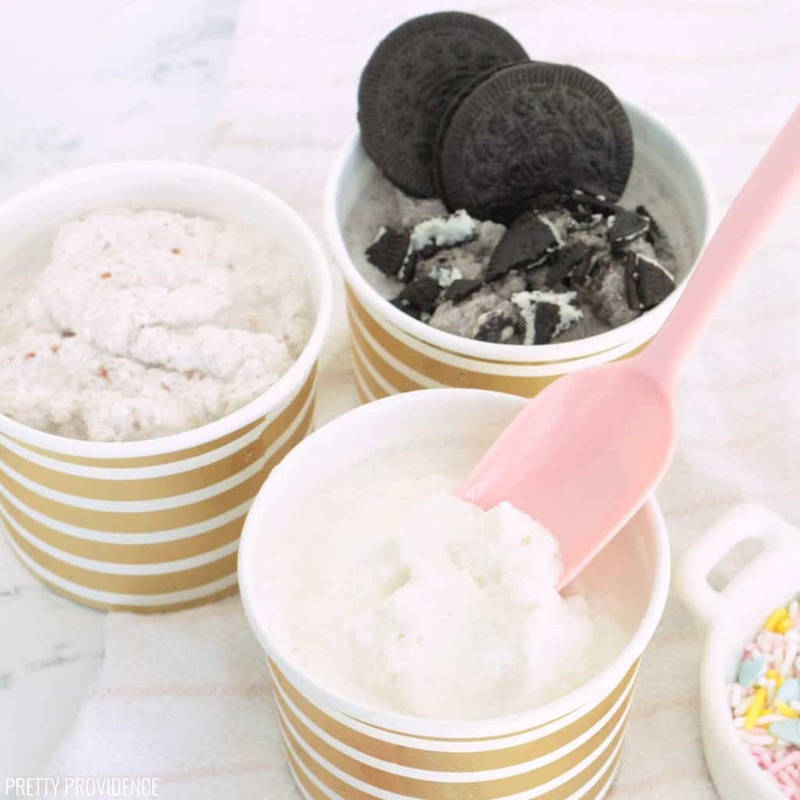 For our strawberry ice cream we add one heaping tablespoon of homemade strawberry jam (soooo yummy) and for the cookies and cream we added one and a half crushed oreos! Once bag is sealed, place inside your second sandwich sized ziploc (we don't want any leaking) and seal tightly. 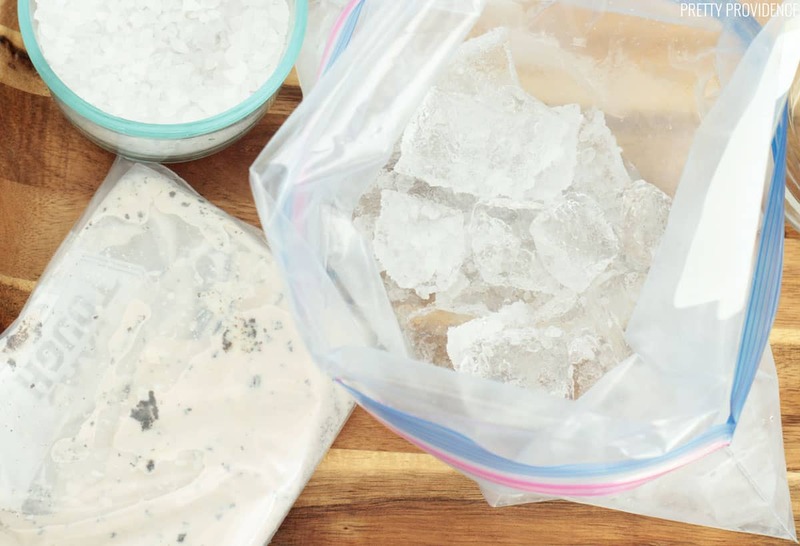 Add your ice and rock salt in the gallon sized bag and then add the sandwich bags full of ice cream mixture. Remove air and seal the large bag. 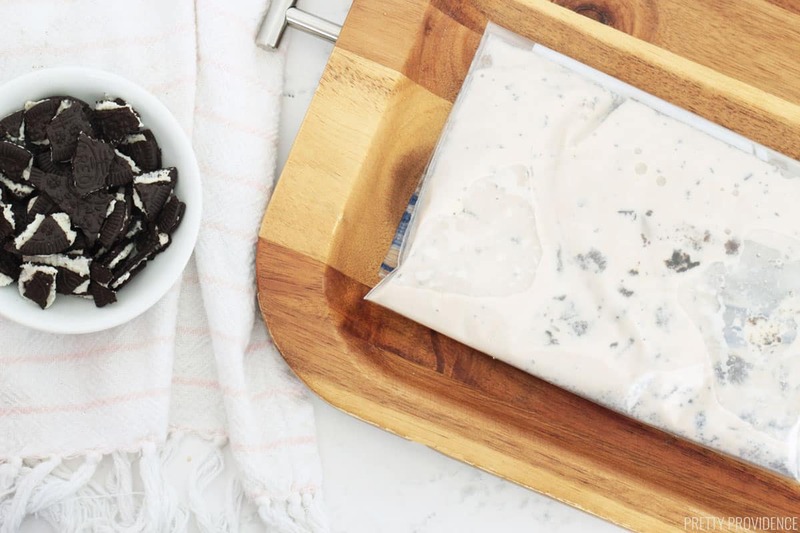 Squeeze and shake your bag until ice cream forms! To achieve the consistency you see in our pictures (about like a thick frosty) we shook for ten minutes each! If you like your ice cream thicker plan on closer to 15 minutes. Either way is delicious! 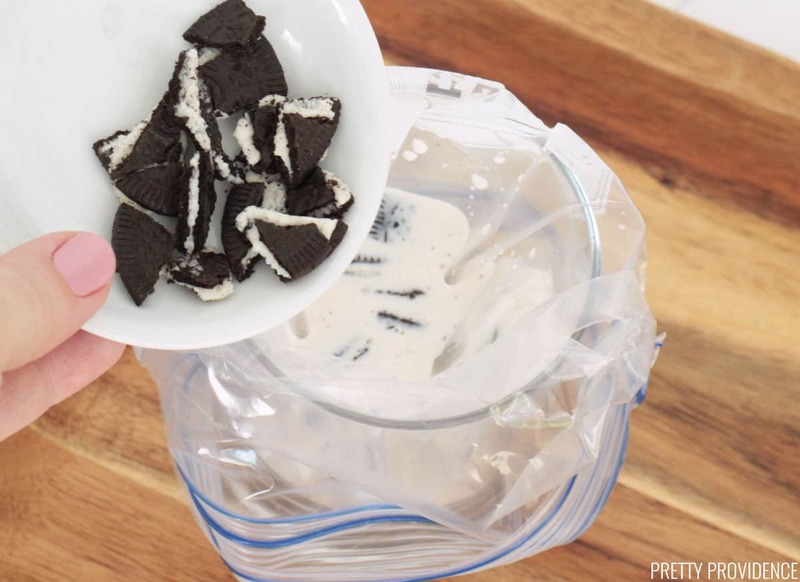 Remove your filled bag from your other bags and enjoy with a plastic spoon. How about a picture tutorial of the whole process? The photos above are of our strawberry variation, and the pictures below are of the cookies and cream option! All the ingredients in the little baggy ready to go! These paper towels are seriously the best. I am in love with them. Thank goodness for Pick Up the Values website because you can get amazing deals that make quality brands as cheap as generic ones! If you haven’t signed up yet, do it now! Little bag in big bag, all ready to go! Since our kids are little we like to incorporate games into the shaking process so they don’t get bored with it after about thirty seconds! Some great ones to try are hot potato, tag, or our personal favorite option… have a dance party! As you can imagine, shaking a bag of ice for ten minutes can get pretty cold! 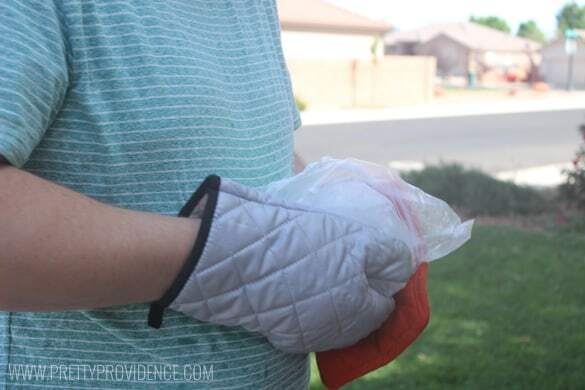 For older kids you can just wrap the bag in your paper towels, but for younger kids we like to use hot pads or winter gloves! All finished! Mmmmm. All that’s left to do is enjoy! I can promise you that we did! Haha. Don’t forget to follow Pick Up the Values via Facebook and Twitter for great deals and to see more awesome ideas from the #celebratefamilyvalues campaign! P.S. If you liked this post you will love this homemade bubble solution or these awesome tie dye sugar cookies! This sounds fun! I’m glad you shared how to make it flavored! I’m adding this to my Summer Fun List! Do it! It’s so fun! And yes, flavors are the best part! How cool and how fun is this?! It looks so easy too. I’ll definitely have to try this out withmy nephews. They would love it. I’ll get them all messy and stuffed with sugar and send them back to their parents. ;) I’m the best aunt! I’ve heard of ice cream in a bag but never tried it! Definitely adding this to our summer bucket list!! You will LOVE it! We seriously have so much fun every time!